LANSING — The American Council of Engineering Companies of Michigan honored firms for engineering and surveying excellence during the association’s annual Engineering and Surveying Excellence Awards ceremony. On March 11, design professionals and guests gathered at The Fillmore Detroit to recognize outstanding Michigan engineering and surveying projects from the past year, as well as engineering professionals who have significantly contributed to the profession. This year’s most prestigious award – the Engineering Eminent Conceptor Award – went to SME (Plymouth) for the Jimmy John’s Field project in Utica. Built over a landfill, this project created numerous challenges. Working against a firm 12-month schedule to have a field ready for Opening Day 2016, SME and the entire project team worked tirelessly to secure funding, design plans that made the site suitable for development, and construct a ballpark that would not only serve as a home for the sport, but that would revitalize a community and serve families for generations to come. 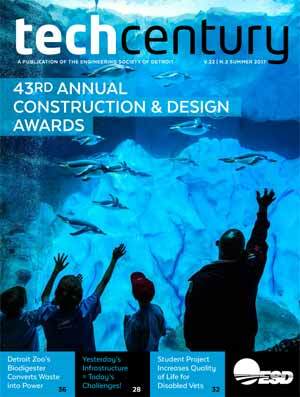 • SmithGroupJJR of Detroit for its work on the Oakland University Engineering Center in Rochester. • NTH Consultants Ltd. of Northville for its work on the Oakland Macomb Interceptor Drain. • AECOM of Detroit for its work on the M-1 Rail Streetcar project in Detroit. • Bergmann Associates of Lansing for its work on the University Drive Diverging Diamond Interchange in the City of Auburn Hills. • DLZ Michigan Inc. of Lansing for its work on the I-94/Sprinkle Road interchange in Kalamazoo. • AECOM of Grand Rapids for its work on the M-100 over CN/GTW Railroad in the City of Potterville. • CDM Smith Michigan Inc. of Lansing for its work on the International Bridge Toll Plaza Reconstruction in Sault Ste. Marie. • Hardesty & Hanover LLC of Okemos for its work on the Fort Street Bridge in Detroit. • Harley Ellis Devereaux of Southfield for its work on the Wayne State University Integrative Biosciences Center in Detroit. • HNTB Michigan Inc. of Detroit for its work on the Regional Transit Authority of Southeast Michigan’s Master Transit Plan in Detroit. • Johnson & Anderson Inc. of Waterford Township for its work on the Pre-Chlorinated Pipe Bursting project for the Charter Township of West Bloomfield. • NTH Consultants Ltd. of Northville for its work on the Detroit River International Wildlife Refuge Pier in the City of Trenton. • Prein&Newhof of Grand Rapids for its work on the Gerald R. Ford International Airport Authority Drainage Improvements and Natural Treatment System project in Grand Rapids. • Ruby+Associates Inc. of Bingham Farms for its work on the Hard Rock Stadium Shade Canopy Erection Plan in Miami Gardens, Fla.
• SmithGroupJJR of Detroit for its work on the Lake Trust Credit Union headquarters in Brighton. • SmithGroupJJR of Ann Arbor for its work on the Link Detroit project. Two firms were honored with a Surveying Honorable Conceptor Award: • Fleis & VandenBrink of Grand Rapids for its work on the Muskegon River Mapping project for the West Michigan Shoreline Regional Development Commission in Muskegon. 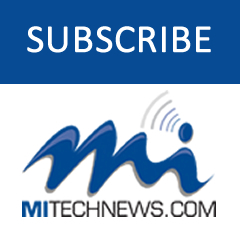 • Surveying Solutions Inc. of Standish for its work on the Gordie Howe International Bridge Data Fusion project for the Windsor Detroit Bridge Authority in Detroit. The Board Design Award was given to AECOM for the board designed to ‘tell the story’ of the M1-Rail project. This year’s ACEC/M Vernon B. Spalding Leadership Award was presented to Robert C. Rabeler, PE, of SME to honor his outstanding leadership roles in ACEC and several community organizations. The ACEC/M Felix A. Anderson Image Award was presented to Philip Sanzica, PE, the Oakland County Chief Deputy Water Resources Commissioner, for his actions and contributions to enhance the image of the profession. The Eminent and Honorable Conceptor award winners are eligible to compete at the National ACEC engineering competition in Washington, D.C.
For more information on the projects and award winners, contact ACEC/M at (517) 332-2066 or visit www.acecmi.org. 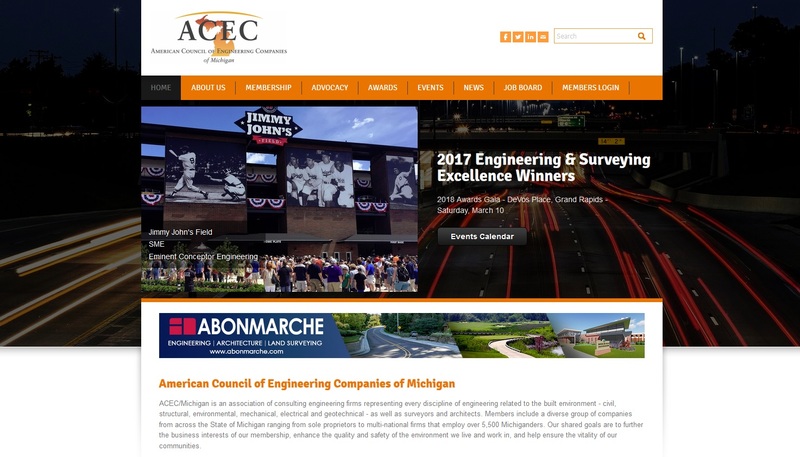 The American Council of Engineering Companies of Michigan has more than 100 member firms around the state, engaged in a wide range of engineering, architectural, and surveying works.